Do you want a dependable and fun compact car? The 2016 Honda Civic is the right choice for you. 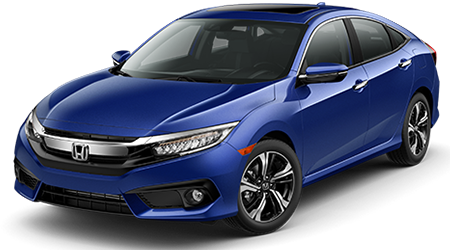 At Burns Honda of Marlton, NJ we carry a big selection of Hondas, including the Civic, which comes in several models as a sedan or a sporty coupe. We stock vehicles with a range of options and packages to suit any shopper’s tastes and budget. As one of New Jersey’s largest Honda dealers, we are proud of our history of providing amazing service to go with our great selection of Honda cars, minivans, and SUVs. We serve Honda owners and potential Honda owners throughout Marlton, Mount Laurel, and Cherry Hill, NJ from our dealership, conveniently located 325 Route 73 in Marlton, NJ. Feel free to browse our online inventory now, then go ahead and contact us to set up a test drive! The compact and economical 2016 Honda Civic offers the compact car buyer great value in all five models, more if you count the Coupe models. The standard engine on the Sedan is a surprisingly powerful peppy 2.0 liter, DOHC, 4-cylinder engine delivers 158 horsepower, enough to provide for smooth merging and passing. That standard engine also offers impressive fuel consumption of 31 mpg city and 42 mpg highway* with the standard 6-speed manual transmission. A continuously variable transmission (CVT) available on the LX, EX, and EX-T, and Touring models returns even better fuel economy. The smaller 1.8-liter engine in the Coupe offers great performance and fuel economy too. All Civic models offer impressive fuel economy and respectable performance on the road. Merging and passing won’t be a problem with either Sedan or Coupe, but driving any Civic model will be fun. The Civic shares a variety of passive and active safety features with other Honda vehicles. Many of those features are standard in all Civics; others are available on select models. Those standard safety features include anti-lock brakes, front airbags, side airbags, tire pressure monitoring, daytime running lights, and traction control. Car buyers with small children will like the child-safety locks and the LATCH anchoring system for child seats. The sturdy, advanced body design and the multiple airbags make the Civic safer place to be than one might expect. The LX. EX, EX-L, and Touring models share the basic safety features but add driver aids that make it easier to stay out of trouble. Overall, it is obvious that Honda places a premium on safety in the Civic Sedan and Coupe. The comfortable and compact Honda Civic exemplifies Honda engineering and design; it offers a safe, comfortable and reliable driving experience at a modest that will impress, at a reasonable cost. If you want a compact and dependable car with good performance and fuel economy, good looks, and safety, the Civic is a terrific option. At Burns Honda, we look forward to showing you our selection of Civic Sedans and Coupes. You can check the current inventory on our Web site and find out more about the many Civic models too. We have a diverse selection of both sedans and coupes in stock or on the way. Come to our dealership on 325 Route 73 in Marlton, NJ and test drive a Honda today! *27 city/40 highway/31 combined mpg rating for 6MT model. 31 city/41 highway/35 combined mpg rating for LX & EX CVT models. 31 city/42 highway/35 combined mpg rating for EX-T, EX-L, and Touring CVT models. Based on 2016 EPA mileage ratings. Use for comparison purposes only. Your mileage will vary depending on how you drive, how you maintain your vehicle, driving conditions and other factors.